Remember the Spiderweb Workshop I gave? Well, some of my students were kind enough to send me photos of their completed ( or almost completed) tops. 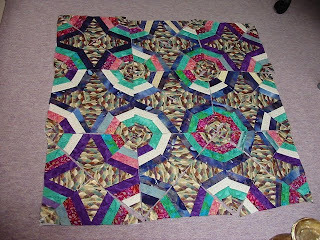 Gerda did mention to me that she had changed the look of her quilt, and would be sending me the changes as son as they were completed. I still like the random feeling of this quilt and the warmth the pinks/reds give. 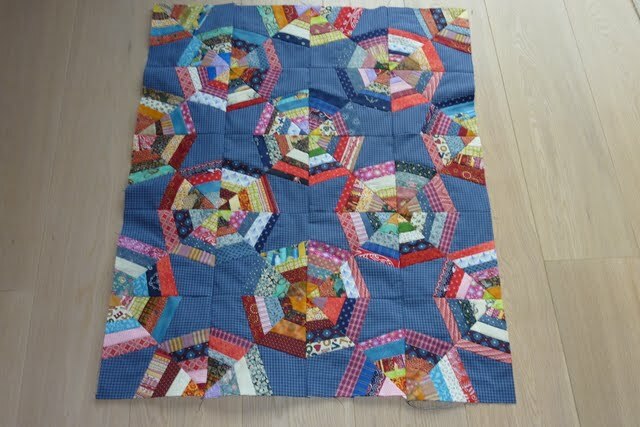 Heleen's quilt is very different! Bright colors surrounded by a cool blue plain fabric. Well done ladies! I'm so enjoying your progress, and can't wait to see the end results!